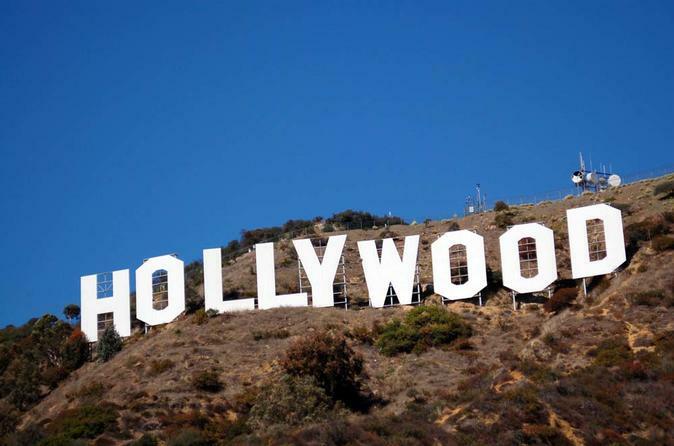 Head to Hollywood: the city where dreams are made. Spend a full day touring the magnificent, historic city in a small-group guided tour. Your driver/guide will tell you everything you want to know about Los Angeles and Hollywood, from Santa Monica Pier to the heart of Hollywood. Enjoy your 14-hour day in a comfortable vehicle equipped with leather seats and USB ports. Group size is limited to a maximum of 7 participants. Tour includes both a light breakfast and lunch and round-trip transportation from select Las Vegas strip hotels. Begin your day with pickup from select Las Vegas Strip hotels at approximately 6:00 am. Then head out on the road with your driver-guide for your journey to the City of Angels! Your informative guide will provide you with a light breakfast and bottled water during the ride. After driving through the Mojave Desert, you will arrive in Los Angeles. Lunch in the Hollywood area is included with your tour. See all the major highlights of the greater Los Angeles area during your time here . Visit the Santa Monica Pier, a landmark that is more than a century old. Admire the iconic entrance and one-of-a-kind solar-paneled Ferris wheel, and see an original carousel hippodrome from the 1920s. You can also enjoy the shops, entertainers, video arcade, pubs, and restaurants, if you wish (food, drinks, and activities at your own expense). The end of the historic Route 66 sign is a great landmark photo spot on the pier. Don’t forget to take off your shoes to feel the sand and step into the Pacific Ocean. Continue to Beverly Hills, home to one of the most famous zip codes in the United States: 90210. Take in the excessive wealth and look for celebrity sightings as you drive by the homes of the rich and famous, where larger buses cannot go . Check out Rodeo Drive, the epicenter of luxury, fashion, and designer stores in the heart of Beverly Hills. At the end of Rodeo Drive is the Beverly Wilshire Hotel, made famous in the movie Pretty Woman. On Hollywood Boulevard, both glitzy and tarnished, good and bad, you can enjoy 'people watching' of folks from every walk of life. Then see Sunset Boulevard, where some of the biggest bands started off in small bars on the Sunset Strip. Night owls still gallivant here on the prowl, at this place with infinite stories from the past many decades. Head to Santa Monica Boulevard, part of legendary Route 66, so famous it has songs written about it. This boulevard showcases diverse backgrounds and cultures that form the backbone of Los Angeles. You'll see the TCL Chinese Theatre, a historic theater known throughout the world for the hand- and footprints of iconic actors. It was also the home of the Academy Awards ceremony from 1944 to 1946. Pass by the Roosevelt Hotel, the oldest operating hotel in Hollywood, right on Hollywood Boulevard, and visit the Hollywood Walk of Fame, the world-famous stretch of sidewalk where you can see all your favorite stars immortalized in stars. Enjoy views of the Hollywood Sign, the historic landmark in the Hollywood Hills (which once read "Hollywoodland") that also provides spectacular views overlooking Los Angeles. After taking in all that this electric city has to offer, you will begin the journey back to the bright lights of Las Vegas for hotel drop-off.